LANZAROTE, CANARY ISLANDS/SPAIN, 10 November 2018 - Congratulations are in full order for 2018 Melges 40 Lanzarote Grand Prix Champion Alessandro Rombelli at the helm of STIG. Racing alongside was tactician Francesco Bruni, with crew members Giorgio Tortarolo, Daniele Fiaschi, Iztok Knafelc, Luca Faravelli, Martino Tortarolo, Pierluigi De Felice and Pietro Mantovani. "We are happy to have won the regatta, and excited about winning the Grand Prix as well," said Rombelli post racing. "This was the goal of the year for us. We had a tough start to the season, but the boat has been great. We sailed very, very well this week." It was a true 'moving' day for Yukihiro Ishida's Melges 40 team SIKON (Manu Weiller, tactician). A drastic improvement in the daily results catapulted him from fourth overall to the runner-up spot on the podium. His daily result of a 2-1-1 proves that he can do it too, hence the fleet's very balance attitude when it comes to tough competition. Proudly standing on the podium in third, Andrea Lacorte's VITAMINA CETILAR (Gabriele Benussi, tactician) ends 2018 on a high note. Touted all season long as the Class rookie, Lacorte and his band of brothers are rookies no more. They confirmed that they have the ability to divide and conquer as they have captured their first Melges 40 bullet, a true diamond in their scoring portfolio. Seated fourth and fifth overall respectively is Valentin Zavadnikov's DYNAMIQ SYNERGY and Richard Goransson's INGA. Of the two teams, Goransson seemed to struggle the most with only one light of brightness today when he and his team won Race Seven. The tenth and final race will be held tomorrow. 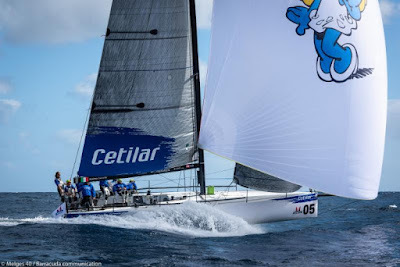 It proves that, although it will not alter the name of the stage and circuit winner, it will decide the podium of both Lanzarote and the entire Melges 40 Grand Prix Series. 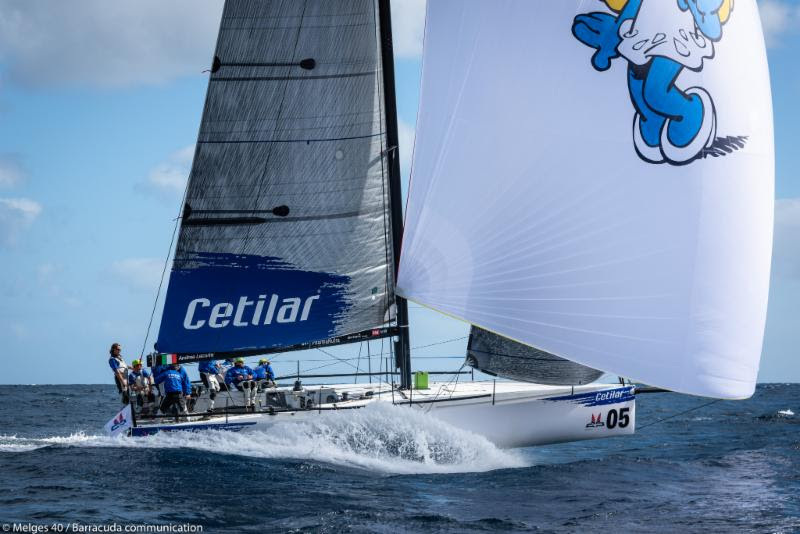 The Melges 40 Grand Prix circuit counts on the support of Helly Hansen, Garmin Marine, and local partners Calero Marinas and Lava Charter.